Your sharps must be disposed of safely. At Direct365, we help you with competitive costs to ensure that you adhere to current Hazardous Waste Regulations at the best price. Get in touch to find out how we can help keep your business safe and save you up to 30%. Businesses in all types of industries dispose of various sharp substances; if you’re one of them then you’re legally obliged to control the waste to avoid health risks in the disposal process. We’ll collect and incinerate your sharps waste in accordance with legislation without interrupting the day-to-day running of your business. We offer regular or one-off services for all types of businesses, comparing over 100 suppliers for the lowest price and making sure you have the necessary containers for safe waste management. Our service plans are flexible and give you everything you need, including a free Duty of Care, helping your business easily stay compliant and avoid hefty fines. Call now for a quote! Sharps waste is defined as being 'anything that has the potential to pierce, or has been used to pierce, the skin'. These instruments should always be put into the correct sharps bin. It's important that your sharps waste is disposed of in a dedicated sharps bin of a suitable size. We will provide you with the correct sharps bin(s) as part of your sharps waste contract. And one filled, from here we take it away for incineration. To you, the producer of the sharps waste, the different bin colours and EWC code 18-01-01 indicates what type of waste goes into which bin. To us, the waste collector, these bin colours and EWC codes tell us exactly where the waste should go and how it should be disposed of. 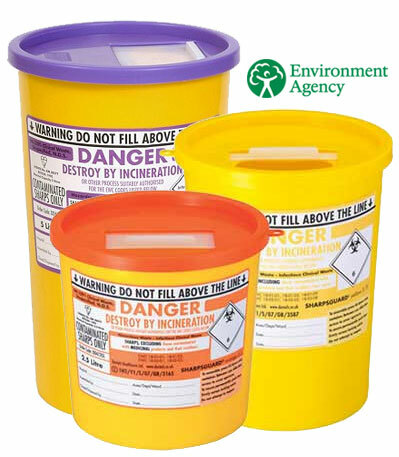 Sharps Bins with a Purple Lid are for cytotoxic or cytostatic waste which refers to medicines (or active agents) which are used to treat cancer, immunosuppressants, anti-virals, or hormone based. The purpose of a Duty of Care note is to document and record the transfer of waste, and to show that you’re complying with all the correct legislation and procedures. We always provide you with an annual Duty of Care certificate with your sharps waste collection. Each time you will need to supply us with your hazardous waste producer registration number. If you do not have one, you will need to register with The Environment Agency annually (unless exempt) which is applicable only to those producing over 500kg. In this case, it's vital that you have the registration number. If not, we cannot take your waste away.